(a) The stress-dependent electric-field-induced strain is shown for 40BCT. The determined electric threshold field, EthrEthr, at 25 °C is overlaid onto the strain data. It indicates the field strength required to overcome stress-induced domain clamping and develop a measureable strain. (b) The electric threshold field is shown as a function of the applied compressive stress and temperature. The large signal strain response as a function of uniaxial compressive stress, electric field and temperature is investigated for compositions across the morphotropic phase boundary in the (Ba,Ca)(Ti,Zr)O3 ferroelectric system. The largest piezoelectric coefficient in terms of unipolar strain divided by the maximum applied field, Su/EmaxSu/Emax, is 1540 pm V−1, which clearly exceeds the piezoelectric response of most lead zirconate titanate materials. The extraordinarily large piezoelectric properties occur in the vicinity of the morphotropic phase boundary region on the rhombohedral side of the phase diagram. In this material, an electric threshold field is observed that is required to overcome the stress-induced domain clamping and obtain a measurable strain response. Moreover, the study reveals that careful selection of composition, stress and field amplitude allow for large signal piezoelectric coefficients of over 740 pm V−1 in the temperature range of 25–75 °C. 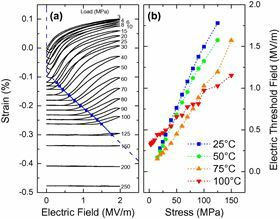 The extraordinarily large unipolar strain response can be assigned to an electric field-controlled regime, in which the unipolar compressive stress induces non-180° domain switching perpendicular to the applied electric field. During electrical loading, the electric field can realign these domains back into the parallel direction, maximizing non-180° domain switching and enhancing unipolar strain. This paper was originally published in Acta Materialia, 78 (2014), Pages 37–45.